Last year was a watershed for the field of intercultural communication, as it brought the publication of the Sage Encyclopedia of Intercultural Competence. Edited by Janet Bennett, the very heavy and extremely useful two-volume set includes about 350 entries by a broad international, multi-disciplinary cross-section of professionals. I am proud to be included among them. While the first entry I was asked to write delighted my soul, the second and third ones were much more of a challenge. 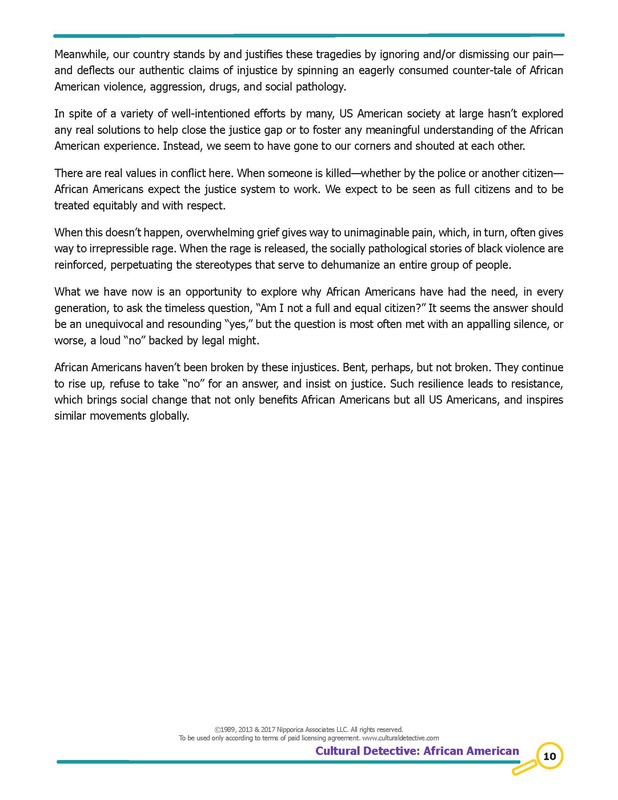 I suppose Janet asked me because there are few people foolish enough to take on a topic as huge, as broad, and as problematic as Communicating Across Cultures with People from the United States. I am USA-born, currently living in Mexico. I love and am extremely proud of my birth country. I am also perplexed and dismayed by it. Such is, perhaps, the nature of a culture that includes 320 million people and nearly 4 million square miles! The USA is so very misunderstood. Any of us born there, who travel abroad, know how it feels to wear the “brand” on our foreheads, to be seen as a “representative” of that “crazy” and yet “incredible” nation. Most people internationally feel a complexity of emotions about the USA and its culture. Many hold stereotypical views, and I saw the encyclopedia as a chance to help explain US culture a bit. In the Cultural Detective series we have the excellently written Cultural Detective USA, written by the incomparable George Simons and Eun Young Kim. The Cultural Detective USA is a tool for developing cross-cultural competence and teaming; an encyclopedia entry is information and knowledge. Thus, the two work together and complement each other very well. In 1980, SAGE published Geert Hofstede’s Culture’s Consequences. It opens with a quote from Blaise Pascal: “There are truths on this side of the Pyrenees that are falsehoods on the other.” The book became a classic—one of the most cited sources in the Social Science Citation Index—and subsequently appeared in a second edition in 2001. 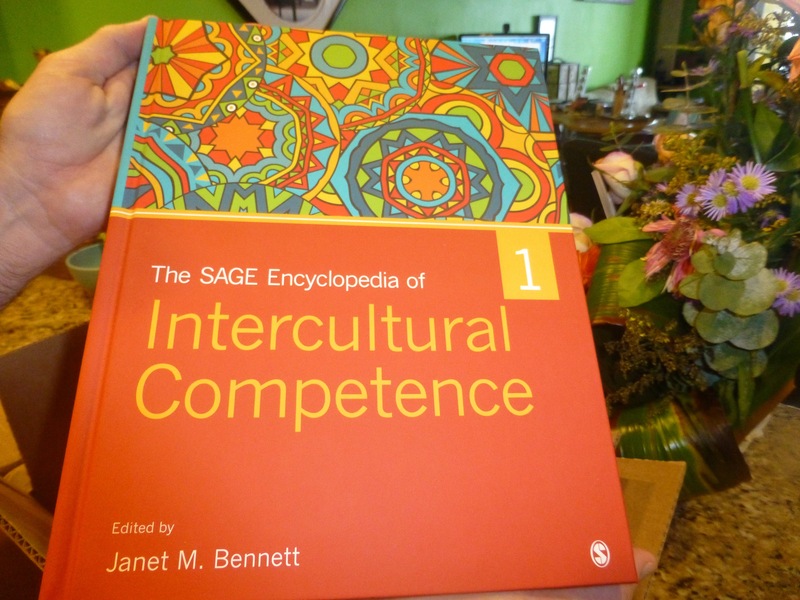 This new SAGE Encyclopedia of Intercultural Competence picks up on themes explored in that book. Cultural competence refers to the set of attitudes, practices, and policies that enables a person or agency to work well with people from differing cultural groups. Other related terms include cultural sensitivity, transcultural skills, diversity competence, and multicultural expertise. What defines a culture? What barriers might block successful communication between individuals or agencies of differing cultures? How can those barriers be understood and navigated to enhance intercultural communication and understanding? These questions and more are explained within the pages of this new reference work. My entry had to be very brief, as the 2-volume set includes over 300 entries. The publishers have given me permission to share my three entries, so here is the link for you to read Communicating with US Americans. I’m sure you’ll find many points you would have worded differently or added in, as nearly everyone has a unique experience of a nation with such a powerful presence on the world stage. I look forward to hearing your comments and additions! 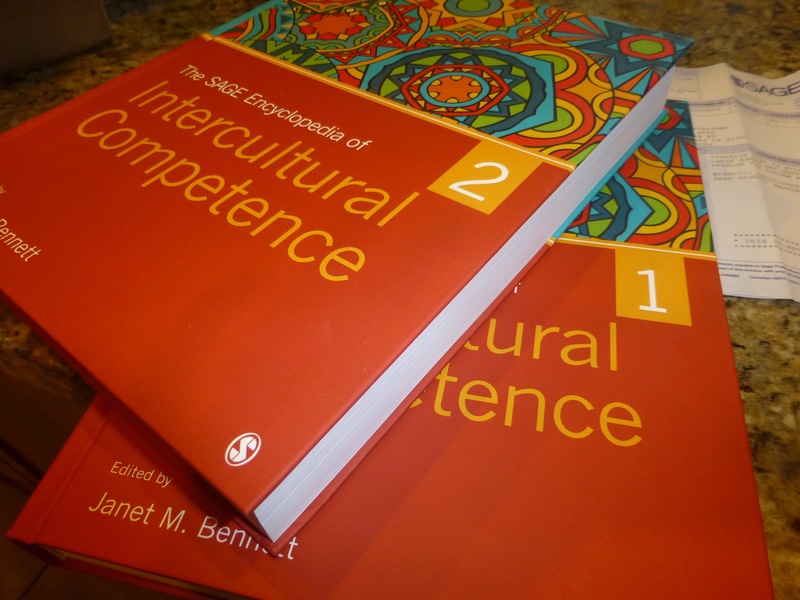 The SAGE Encyclopedia of Intercultural Competence is a huge contribution to our intercultural field, a long overdue volume to which dozens of professionals from multiple disciplines worldwide have contributed. I am honored to be counted among them. My primary expertise over the three-and-a-half decades of my career has been multicultural, virtual team effectiveness, global managerial competence, and Japan. Thus, when the Encyclopedia’s editor, Janet Bennett, called to ask me to author Communicating Across Cultures with People from Latin America, I was incredibly intimidated. Latin America (México), has been my home for the past eight years. I absolutely love it here. I frequently travel for work and pleasure to other nations in the region. But Latin America is a fairly new professional topic area for me. However, I agreed to author the entry because I wanted to be sure that this region—so hugely important on the world stage today—was not overlooked. There are interesting social, environmental, and political movements in Latin America that I don’t see happening elsewhere; the region has a lot to teach the world, an important voice to contribute. Sadly, outsiders often lump the region together into one monolithic whole. Yet the reality is that there is huge diversity within Latin America—and within each country in the region. Heck, it’s hard just to get people to agree which nations are included in “Latin America” and which aren’t! The Cultural Detective series includes several excellent packages on Latin America, including CD Argentina, CD Brazil, CD Chile, CD Colombia, CD Dominican Republic, CD Mexico, and CD Latino/Hispanic. These are tools to help develop our skills, our abilities to work with and live in harmony with people from these cultures. Thus, they are excellent complements to the academic-oriented, knowledge-based encyclopedia entry. The publishers have given me permission to share my three entries, so here is the link for you to read Communicating Across Cultures with People from Latin America. 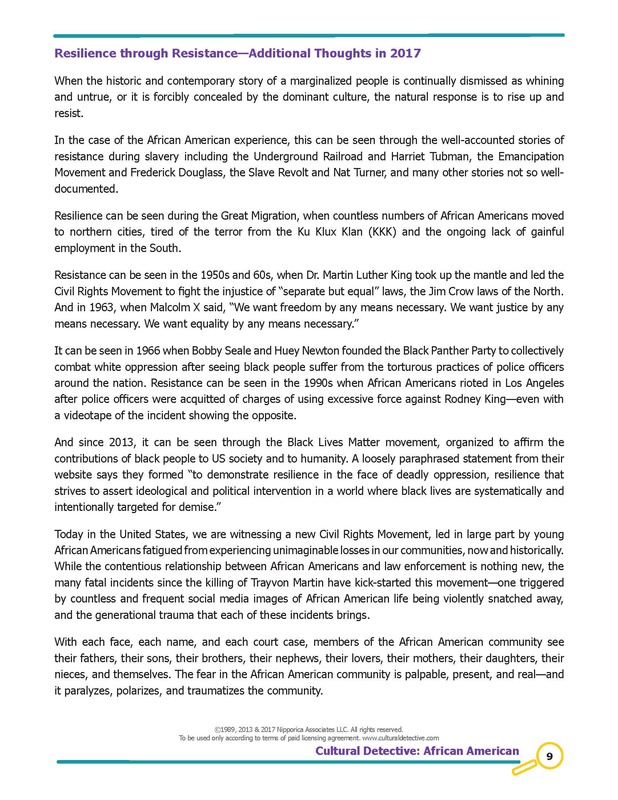 I would very much like to thank those colleagues who generously shared their expertise, differing viewpoints and experience with me as I worked on this entry: Patricia Coleman, Lucy Linhares, Adriana Medina, Fernando Parrado, and Shirley Saenz. Any errors are, of course, my own, but their input greatly enriched the finished product. Please let me know what you would add or reword! By the way, if you are interested in Latin America, I invite you to join Fernando Parrado and me for “Latin America and Its Place in World Life” (Session I, Workshop 6) at the Summer Institute for Intercultural Communication, on the Reed College Campus, Portland, Oregon, July 13-15, 2016. I will admit to being stymied by the heated debates about mixed-gender public toilets. For those of us who travel, we know that there are so many places in the world with mixed-gender toilets. Sometimes one walks in past men urinating in order to reach a private stall. Of course, in other locations there is a stalwart bifurcation, a clear separation between men’s and women’s toilets. I am reminded of a beautiful and wise concept that I learned about as a child. Growing up with Diné, or Navajo, friends in northern Arizona, I was privileged to learn so very much from their experiences, their families, and their culture. One of the transformational ideas for me was that of “two spirits”—that individuals can be both man and woman. Traditionally, this is a blessing, an honor. I can sure see why! Access to differing world views, and a broader emotional, cognitive, and expressive repertoire would be just some of the assets a “two spirit” gender might provide. Across the planet this fluid or blended gender concept has many terms, some of which you can see in Independent Lens’ interactive “Map of Gender-Diverse Cultures.” From the comments, it appears there remains a need for significant tweaking of the information provided, but it sure is a helpful start to a review of world beliefs and practices on fluid or non-binary gender identification. I urge you to take a look and do some clicking and reading! Be sure also to subscribe to Cultural Detective Online or license the PDF package and spend some time with our newly updated Cultural Detective Lesbian, Gay, Bisexual and Transgender. It contains a wealth of useful information, and the approach helps us learn to partner across sexual orientations and gender identifications. It is absolutely one of the best resources of its kind. I am so proud of the international team that put it together. A few years ago, PBS in the USA aired an interesting documentary entitled Two Spirits, directed by Lydia Nibley. It provides an introduction to the topic for those who’d like to learn. The film is available for rent or purchase from Cinema Guild, or via online streaming. In addition to the preview below, there are quite a few companion videos and activities on PBS’ website that are still available and free of charge. Thank you and kudos to all those involved! This post, authored by Dianne and Fernando Parrado, was originally published on the ICI blog on April 6, 2016. Información en español. Latin America is assuming its rightful place in the global arena, not only as a leading economy, but also as a model for innovative social movements. This largest region in the world has long been admired for sharing its powerful music, dance, literature, visual art—and the only world heritage cuisine. Latin America has taken a key leadership role in exploring innovative solutions for restructuring societal inequity and promoting responsible development and the sustainable use of natural resources. Many of these efforts are based on popular, direct-democratic movements, including indigenous social movements. However, the outstanding features of Latin America culture continue to be a sense of timelessness, an emphasis on the worth of personality, and an instinctive protest against the idea that success in business and the accumulation of wealth are superior to the acquisition of culture. Eleven Latin American nations include multiculturalism and multilingualism in their constitutions, and an additional four recognize indigenous rights. The average Latin American thinks differently about such fundamental concepts as time, work, success, joy, truth, and beauty. In other words, it is life itself, not its possessions or achievements, that tend to be most worthwhile to Latin Americans. Being what you want to be is generally more important than getting what you want. The Latin America worldview may hold the answers to many of the issues facing our world today, including climate change. Yet Latin America has often been culturally misunderstood. Important Latin American values such as communalism, expressiveness, celebration, and indigenous respect for the earth are frequently under-appreciated. While often viewed as a single market with a shared language, religion, history, and culture, it is actually home to hundreds of languages and ethnicities, and diverse histories, geographies, economies, and political systems. Latinos abroad bring perspectives and insights that can be used to generate innovative solutions and create vibrant, cohesive communities. As group orientation breaks down in various cultures worldwide, we must ask: Are we making the most of Latino talent? What do we need to do to be interculturally competent with members of the Latino diaspora? We very much look forward to having you join us for this highly experiential workshop where we will explore the richness, complexity, irony, and promise of the hundreds of cultures that comprise Latin America. 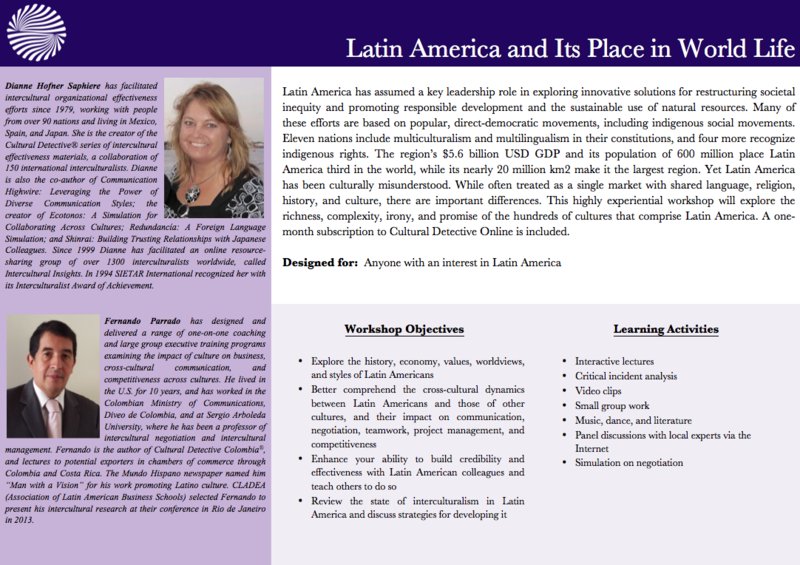 Taught by both of us, the workshop is called “Latin America and Its Place in World Life,” and it will take place July 13-15, 2016, during the 40th annual Summer Institute for Intercultural Communication. During the workshop we will look backward: what Latin America looked like during the height of the Incan, Mayan and Aztec civilizations, what the conquista and the slave trade meant for the region, the gifts of resources and talent the region has provided, and how such history and heritage affects life in the region today. 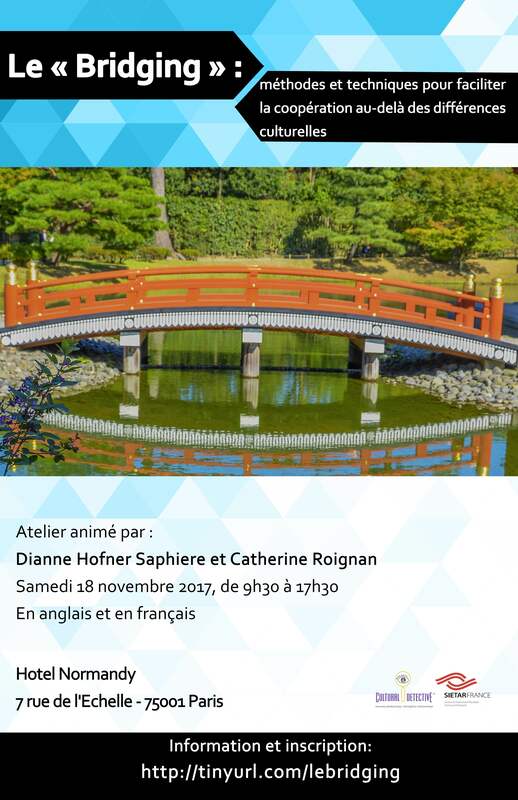 We will look at the present: how do people from different ethnicities, socio-economic levels and geographic areas communicate and collaborate, and how can we work and live with them more effectively? Finally, we will also look forward: what are some of the unique experiences and insights that Latin America has to share with the world, and what we can learn from Latin America to enrich our view of life? Those of you who enroll in the workshop will receive a one-month subscription to the Cultural Detective Online, so you can use this resource during the workshop and have time afterwards to continue your learning at your convenience. SIIC is one of the world’s premier venues for networking with and learning from professionals in the fields of intercultural communication and diversity. We trust you’ll join us for this annual learning opportunity! Click here to register for Session 1, Workshop 6, Latin America and Its Place in World Life.